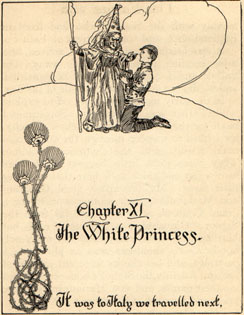 Chapter XI: The White Princess. Chapter XI: The White Princess. "Chapter XI: The White Princess." by Lilian Gask (1865-). Publication: Gask, Lilian (1865-) The Fairies and the Christmas Child. Illustrated by Willy Pogány (1882-1955). London: Harrap & Co., n.d. [First published 1912] pp. 217-238. It was to Italy we travelled next, to stay with the Signor, who had lived in England once, and was a patient of Father's. It was fearfully hot when we arrived, and most English people had gone away; but Father and I could bear a lot of sunshine, and we did not go out in the middle of the day. In the early mornings I went off to explore while Father was still asleep. Sometimes I made for the hills, but often I chose the city, for I liked to wander through the streets and make friends with the chattering children. They were jolly little beggars, with bare brown feet and thick dark hair that fell over their faces. My favourites were Giovanni and Mariannina; their mother worked for a grand Contessa who lived not far from the Signor. Giovanni was thin as a reed, but Mariannina, whose curly head did not reach her brother's shoulders, was as plump as a partridge, and her cheeks were red instead of brown. Adelina, the Signor's housekeeper, told me their names, and that Mariannina was the pride and torment of Giovanni's life. "He adores her," she said, "but she is surely bewitched. She runs from him like a squirrel, and is an imp for mischief. Ah, the poor Giovanni–he has his hands full!" After this I often met them, and if Mariannina were in a good humour she would smile at me through her lashes, while if she were cross she would frown like a Witch, and even shake her tiny fist. At this, Giovanni would look quite shocked, and would beg me in broken English not to be hurt at 'la sorellina's' unkindness. "She so ver' small!" he pleaded wistfully, and this was always his excuse for her. One day she took it into her head to run away from him, and darted into the middle of the road, almost under the heels of some prancing horses. I happened to be close by, and seized her red skirt just in time to drag her back. Panting with terror, Giovanni took her from me, and when he found she was not hurt, for the first time in his life he shook her. And then he tried to kiss my hands; I almost wished I had left Mariannina to be run over. Before I could get away from him, he had thrust upon me the small gilt cage he always carried about with him, and had but just now tossed on the ground. It held his cherished 'grillo,' or cricket, a curious pet of which all his playmates seemed very fond. "It is yours, it is yours!" he cried, and seemed so grieved when I tried to give it back to him that I was obliged to keep it. The cricket was a merry little creature, with a very loud voice for his size. "Cree-cree-cree!" he chirped, as I carried him to the villa, and he never once stopped all day. I believe that he sang the whole night through, for I heard him in my dreams, and when I woke I determined to set him free. I carried the little gilt cage up the slope of a hill before I opened the door. No sooner had he hopped on the grass, when his "Cree-cree-cree" was taken up by hundreds of other crickets, who gathered round him in great excitement, chirping with all their might. As I put my fingers into my ears, a little old woman appeared from nowhere, and with a wave of her hand sent them all away. "Many mouths make a small noise great," she said, 'and you are not the first to be wearied by the crickets' song. The Sorcerer of the Seven Heads * liked it as little as you did, and the White Princess owes her happiness to this. I say what I know, for I am her Fairy Godmother." "Why, they told me there were no Fairies in Italy!" I cried. And then I was sorry that I had spoken, for the little old woman grew pale with rage. "No Fairies?" she exclaimed. "Ah, foolish ones, worse than blind! Had you not believed them you had seen countless Witches and Fays ere this, for Ascension Day has come and gone, and they are all set free. Besides these, there are Goblins and Spirits, and fearsome Incubas, and shadowy Fates who sway men's destinies. All these abound in our sunny Italy for those who have eyes to see; and there are also Fairy Godmothers, such as I. The maidens for whom I stand sponsor comb jewels out of their hair; diamonds and pearls, rubies, and shining turquoise. But the White Princess' were always pearls; and pearls often turn to tears." "The Fates had dowered Queen Catherine with gifts; but though her husband was devoted to her, and the kingdom was blessed by a long spell of peace, she sighed unceasingly. One boon alone had been denied her, and without this she did not care to live. 'Let her have her way!' cried the Fates at last, weary of her complainings. So one summer dawn a babe was found in the bed of lilies beneath her window, and now her mourning was turned into joy. For a daughter had been her heart's desire. The little Princess was christened Fiorita, but from the day of her birth she was known as the White Princess. Her skin was as purely pale as the petals of her guardian flowers, and the yellow gold of their stamens was the colour of her hair. But out of her eyes looked a spirit that boded sorrow–the spirit that would fain know all. The White Princess grew lovelier day by day, smiling but seldom, and staring for hours at the distant line of the far horizon, where the hills kept watch for ever over the land Beyond. The Queen looked on with delight at the unfolding of this tender blossom, but her happiness did not bring strength, and when in due time the sweet coral lips lisped the soft word 'Mother,' her soul broke the bonds which held it, and sped away. Fiorita was now twice orphaned, for her father, the King, would scarcely look at her, since he connected her coming with the death of his beloved wife. In order that the sight of her might not continually remind him of his sorrow, he built a fine tower of gold and crystal, and here, surrounded by all her ladies, the White Princess grew into womanhood. Lovely as snow crystals, and cold as the arctic wastes, Fiorita made few friends, and spoke to none of her inmost thoughts. The Kings of the Earth who came to woo her were abashed by her strange white beauty, and only the Prince Fiola remained to ask her hand. He was brave as a lion, and gentle as a woman, as true knights are to this very day. The sound of his voice as he spake of his love stirred the Princess' heart to a secret joy; but him, too, she sent away with but a glance from her blue-grey eyes. And though I, her Fairy Godmother, scolded her well and entreated her to say him yea, she would not be persuaded. 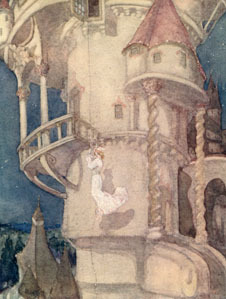 "Lowered herself from her window by means of a rope of pearls"
'First I must see what lies hid in the land Beyond,' she said, and that very night, when the Crystal Tower shone wanly in the moonlight, and all her ladies were sleeping, the Princess covered her snow-white robe with a gossamer cloak of clouded grey, and lowered herself from her window by means of a rope of pearls, passing through her gardens and into the forest, which lay between her and the land Beyond. All fearless in her virgin purity, she listened neither to the Goblins who eyed her hungrily from the shapeless trees and besought her to show them favour, nor to the warnings of compassionate Fays who bade her return to the Crystal Tower. 'I seek the land Beyond,' she cried, not knowing that she could never reach it except on spirit wings. Now the Prince Fiola could not sleep for love of her, and this night he stayed his restless wanderings in the Palace grounds by the waters of a placid lake, for the fancy came to him that therein dwelt some kindly Sprite who, perchance, would give him counsel and further his suit. Clear shone the moon above, making the smooth surface into a fairy mirror which reflected the swaying trees and the mysteries of forest depths; and as he looked, the Prince descried the shape of a slim white form which seemed to be hurrying onward amidst a forest. The poise of the head was Fiorita's; her's, too, was the queenly gait. But thinking her to be safely sleeping, the Prince believed that his eyes were cheating him, and moodily resumed his walk. When morning came, however, he hastened to the Crystal Tower. He found it in great commotion. Doors were opened and shut in rapid succession, and scared attendants ran in and out like ants. As the Prince stood bewildered, the King came up. The remembrance of his lack of love was heavy upon him, and he strove to stifle his remorse by loud threatenings of dire punishment to all if his daughter were not speedily recovered. As he stood quietly aside in the midst of the commotion, Prince Fiola remembered the vision of the lake, and bidding a groom go fetch him a horse, he mounted and rode straightway to the forest. Two paths stretched out before him; his horse would have taken that on the right, but the Prince urged it along the other, for he thought that he caught a glimpse of his love's white gown at the end of a woodland glade. It was only the feather of a dove, however, and he pressed on, barely slackening his pace for hours. Darkness fell, but there was still no sign of Fiorita, and when he reached the borders of the forest, and yet had found no trace of her, his heart was sick at the thought of her peril. He could not stop, so with only the stars to guide him, he essayed to cross the waste that lay beyond, and at dawn was still riding wearily on. By the following noon both horse and rider were exhausted. The burning sun blazed down on their heads, smiting them as a sword, and though the Prince had no pity on himself, he grieved that his horse should suffer. Dismounting, he led it on until he came to a great rock, down the side of which flowed a stream of water. When he and his dumb companion had quenched their thirst, he took off its bridle and set it free, for he knew that the faithful creature could carry him no further. And now began the most toilsome part of his journey. With the land Beyond always before him, he trudged on and on, turning aside for nothing; and so passed another day and night. Now the long road wound uphill; stones blocked his way, and thorns tore his hands and face; still he pressed on, for his love was stronger than hunger and thirst, and pain had no terrors for him. Nevertheless, he had lost all hope, when a turn in the path disclosed a sight which made him for the moment forget his trouble. 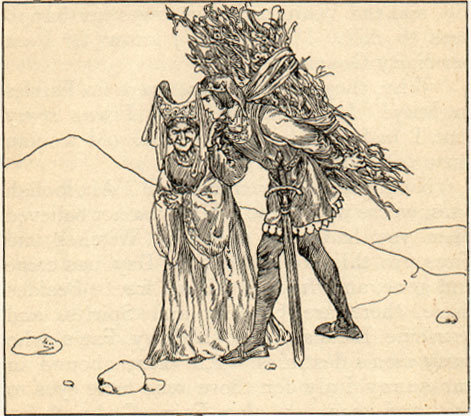 A bent old woman, crooked and frail, staggered beneath a load of sticks, and dancing along at either side of her, were two rough boys, who mocked at her lameness, calling her a Witch. The Prince overtook them with rapid strides, and knowing that the power of gentleness is more lasting than that of anger, he suppressed his wrath as he spoke to them, though withal he reproved them sternly. 'Know you not,' he said, 'that only cowards persecute those who are weaker than themselves? 'Tis a woman whom you call 'mother,' and if only for this, you should hold all women in reverence. Now go and remember what I have said. Here is something to purchase a gift for your parents. See that you are more worthy of their care.' And with other words to the same effect, he gave each a silver coin. Won alike by his kindness and the justice of his rebuke, the boys asked pardon for their rudeness, and scampered off with glowing faces, while the old woman blessed the Prince for thus befriending her. Disclaiming her thanks, he lifted her load to his own shoulders, when it immediately became as light as air. The next moment it fell from him altogether; and he turned in great astonishment to meet her serious gaze. 'Even that can I do!' cried the old woman, straightening her bent figure until she stood before him tall and queenly, her squalid rags changing into flowing robes of purple velvet. The Prince feared nothing so that he might once reach the side of Fiorita, and gladly submitted himself to the enchantments of the Witch. Lucretia lifted the silver wand that was hid in the fold of her gown, and at its touch the Prince became a cricket, just such another as the one which you lately restored to liberty. Having muttered an incantation, she blew thrice on an opalescent shell which dangled from her waist upon a ruby chain; and troops of Fays and Witches came hurrying down the road. Some were slender and stately, with faces as fair as dreamland; some were twisted and bent, and some so small that a dozen could hide in the cup of a flower. 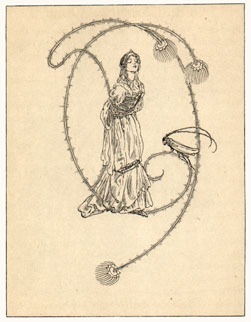 With a second wave of her silver wand, Lucretia transformed them into a myriad crickets. Hailing Fiola as their king, she placed him at their head, and reminding him solemnly that persistence conquers where force must fail, bade him lead them back to the forest. In an incredibly short time this aerial army arrived at the castle of the Sorcerer with the Seven heads. It stood in the midst of a dense thicket, surrounded by a moat, the lurking place of demons with long forked tongues, and eyes that shot evil fires. Undaunted by their snarls, the crickets flew over the drawbridge, and finding a way into the castle through the close-barred windows, swarmed round the Sorcerer's head. A cauldron swung from the domed ceiling, over a quenchless fire, and in this the wretch was even then concocting a potion by which he should overcome Fiorita. Her purity had hitherto protected her, and though he had bound her body with chains, he could not fetter her spirit. 'How dare you disturb me?' he roared, lunging at the crickets vainly with a long and glittering knife. Fiola would fain have slain him where he stood, but when, forgetting his impotence, he hurled himself forward at the monster, he only tickled his nose. 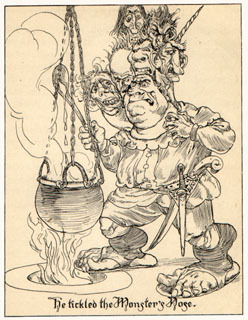 Now the Sorcerer having seven heads–Greed, Envy, Spite, Malice, Passion, Jealousy, and Despair, each of which would have instantly sprung forth again had Fiola been able to chop it off–he had naturally fourteen ears, and these were so extraordinarily sensitive to noise that he had destroyed all the woodpeckers in the forest that he might not hear their tap-tap on the trees as they searched the bark for insects. You can judge, then, of his disgust when on his refusal to obey Lucretia's command, and break the bonds which held Fiorita, this host of crickets swarmed round his head, and filled the air with discord. Each pitched his voice in a different key, and the din of battle was as nothing to that which now pervaded the castle. Cricket-Witches, from grass and ditches. Till thou bidst the lady go. Over and over again they chanted this lay, and every cricket, far and near, joined in the maddening chorus. They sang until the Sorcerer with the Seven Heads felt that his senses were leaving him; pallid with rage, he severed the White Princess's chains. By the power of Lucretia, who had clearly foreseen his discomfiture, the moment that the chains fell from her Fiorita immediately became a cricket also, and gladly did she fly to the side of the Prince, who greeted her with rapture. All would now have been well had they straightway left the castle, for Lucretia waited outside to restore to them their human form. As Fiorita passed the great cauldron which still swung over the lamp, she could not resist the temptation to lean over and peep inside, and the fumes from the potion being very strong, she straightway fainted, falling into the midst of the blood-red liquid. Before it could wholly cover her, the Cricket King seized her wings in his mouth; he carried her thus into the open air, where she speedily revived. Great was Lucretia's concern, however, when she heard from Fiola what had happened. Then Fiorita was sad indeed, for she had lost her longing to see the land Beyond, and desired nothing better than to wed the Prince. But now that he knew she loved him, no spell could dampen Fiola's joy. 'While you are a cricket,' he said, 'I will be one too, for so long as you are beside me–what matters else?' And the Fays and Witches, who reverence all true love, elected to share their banishment. And so it was, and is to this present time. For half the year Fiola is the Cricket King, and Fiorita, more than content, his Queen. But as Ascension day comes round, the spell is broken, and they take their accustomed places at the Court. It is hard to say when they are the happier; for love is as much at home in the humblest corner of Mother Earth as it is in a lordly Palace."